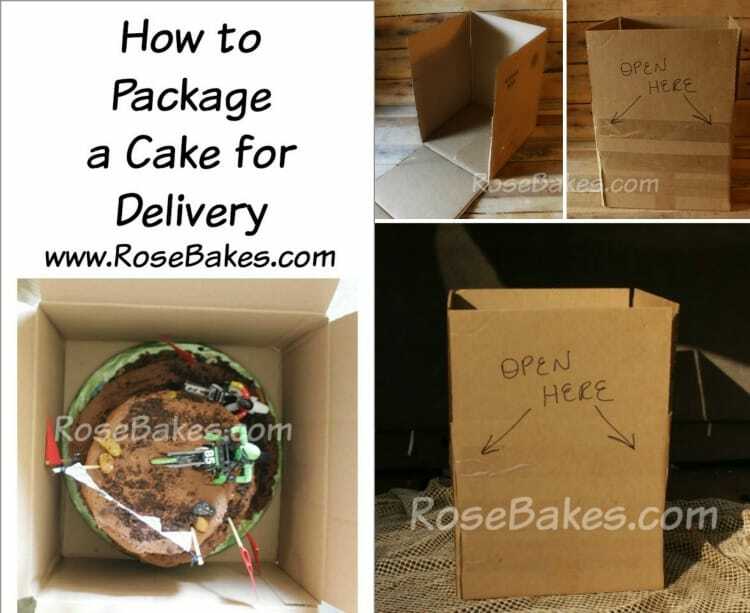 How do you package cakes for delivery? How do you package cakes for delivery? This question was sent to me from a reader to post on the All Things Cake group and I totally high-jacked it to write a post today. Hahaha! I have a horrible backache & headache today and I’m sitting on the couch with a heating pad and well… too much time on my hands. I did still post the question in the group … go join the group (if you haven’t already) and see some great advice on that post. But I thought I’d also do a more detailed post to answer here about what I personally do. Be warned, this post is sort of thrown together… not a lot of planning or anything, so the pics are just picked from random things I had already photographed (except the empty box pics – I got my sons to set those up and snap a few shots). And very little editing… I ain’t got no time for that today! Hi Rose! I was wondering how you package your cakes for delivery? I live in an area that tends to be very windy and the weather is very unpredictable and I worry every single time I have a cake delivery. I also take someone with me to hold the cake! There has to be a better, less stressful way! First up – I live way out in the country. Nearly 10 miles from my tiny hometown and around 40 miles from where most of my cakes go. So when I talk about delivery – I’m talking about meeting my customers in my tiny hometown where I hand the cake off to them to take to their home (usually around 30 miles away). The only cakes I deliver completely (to the final destination) are wedding cakes. SO when I package cakes – they have to be good for me transport and good for my customers to transport. I always advise them to keep cakes cool and level! If they need help with the leveling, I’ll actually put it in their car, level it on the seat with a rolled up towel or t-shirt, buckle it into the seat, or wedge it onto the floorboard where it’s snug and safe. Also, please note that my cakes are doweled from top to bottom with the dowel being driven into the cake board that the cake is sitting on. That way no tiers move or tip or lean. For 99% of my tiered cakes (non-wedding), I box them in a brown shipping box from OfficeMax.com (again, I’m way out in the country – I can’t buy these things locally). I buy them in bulk and save lots of money that way. Plus, they often run “Buy One Get One 50% Off” sales and if you spend $50, shipping is FREE and that’s a BIG DEAL when ordering boxes because they’re so heavy. For information on buying cake and cupcake boxes, check out THIS POST! 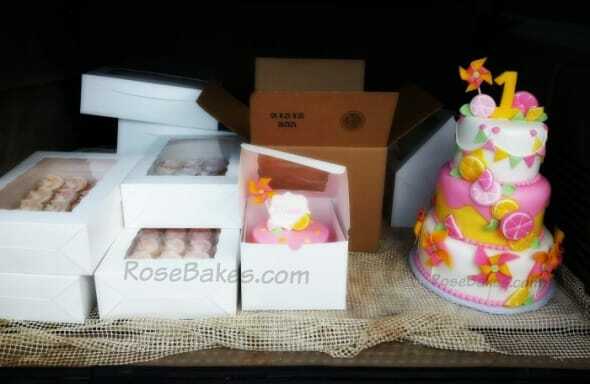 I put most of my cakes on 8″, 10″ or 12″ round cake boards, so I buy 8x8x10 boxes, 10x10x10 boxes and 12x12x12 boxes. And I have some 14x14x14 boxes too, but I don’t use them often. 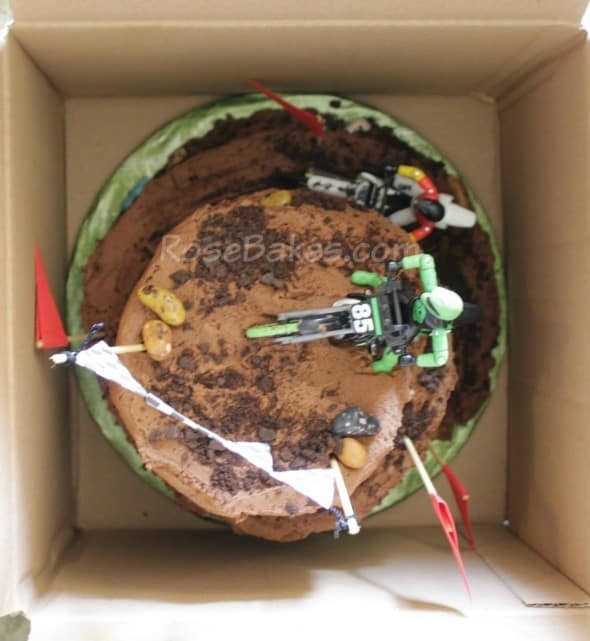 You can see here a cake on a 12″ round cake board, sitting down in a 12″x12″x10″ box. It’s very snug in there! I simply cut down two sides of the box, slide the cake in and tape it back up. I use a marker to write on the sides to let clients know where/how to open it. Easy-peasy and budget friendly! Then – to actually transport them, I put them in the back of my truck on a non-slip rug mat. I bought a huge one that covers the entire back of my Excursion. Nothing slides around. I’ve never had a cake fall or slide or move at all. I do it with multiple cakes or even a single cake… I just set the box in the middle and it’s good to go! 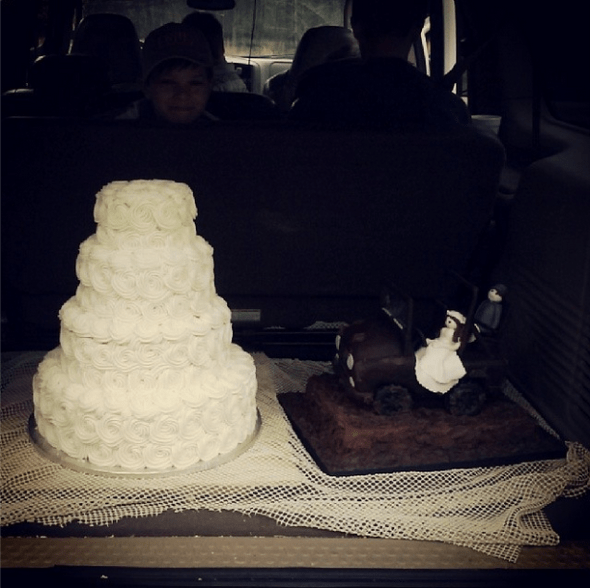 Now, for wedding cakes, transportation is the same except I skip the box and just set them on the mat. 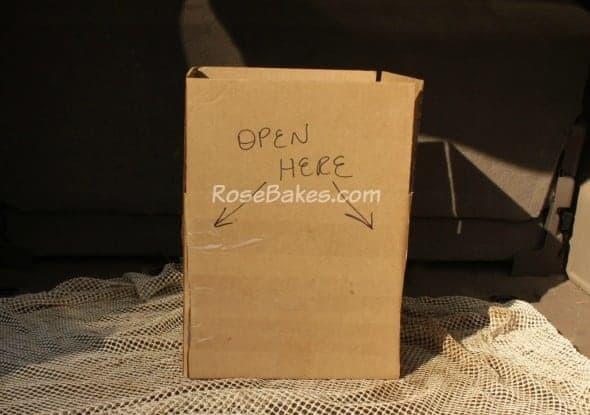 Or if I know the cake will be too big for a box (like the Pinwheels & Pink Lemonade Cake), I warn the customer ahead of time that it will not be boxed so they can come in a vehicle where it can sit upright or have someone with them to hold it. I cannot tell you how many wedding cakes I’ve done – more than 200 I’d say – and I’ve only ever assembled two on-sight. So 99% of them are stacked and doweled in my home, then driven the 40-60 miles to the venue. My husband hates for me to say this (he thinks I’ll jinx myself), but to this day, I’ve never had a single incident of with one falling, crumbling, etc. I’ll even tear off a piece of my non-slip rug mat and let them use it if they need it (it’s cheap and easily replaceable)… anything to keep the cake intact!! So that’s that – how I package cakes for delivery. Do you have any questions? If you do it differently, I’d love to hear how YOU package cakes for delivery!! Leave me a comment! 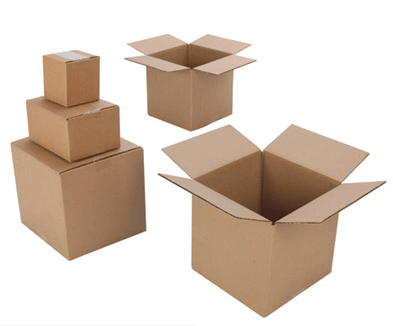 Thanks for the great tips, especially where to find the boxes. I live out in the country too and have a hard time finding them. THANKS!! Thanks so much for sharing! Where do you get the boxes for the cupcakes? 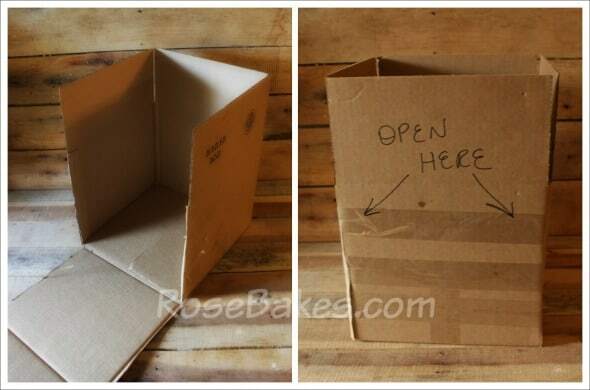 Cutting the box and re-taping it is an awesome way to slide in the cake, keep it safe and sanitary. If you have a tiered buttercream cake order due on Friday evening, when would you suggest putting the crumb coat and final coat of buttercream and stacking the cake? Would that be Thursday and just box it up for Friday? I don’t want to run the risk of the cake drying it before the actual event. Thanks a Million!! It really depends on how long it’ll take to decorate or if you have other things going on. I would do it either Thursday night or Friday. Do you transport the cakes fully assembled? I do! Out of the 1500+ cakes I’ve done, only twice have I ever taken a cake unassembled to the location. I love your website. You give a lot of tips. 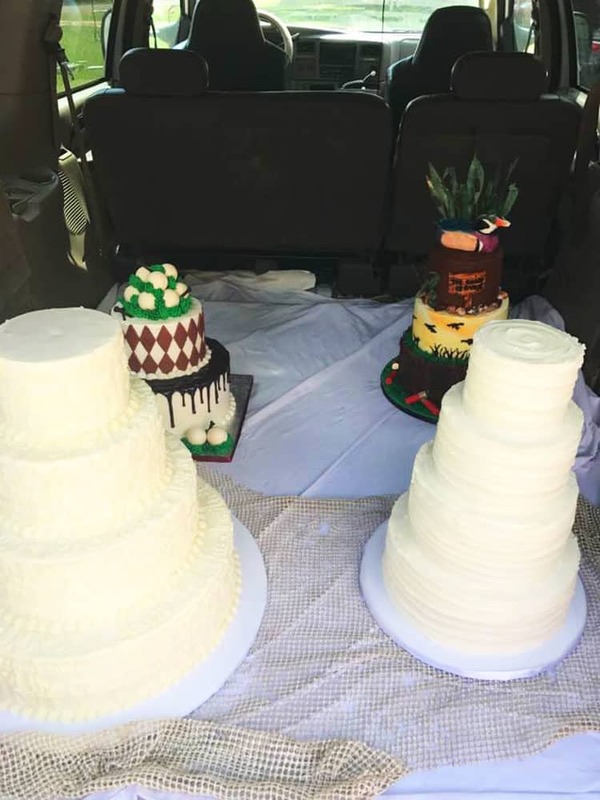 I just wanted to ask you, do you prefer taking the wedding cakes already assembled all the time or, are there occasions where you would assemble the cakes at the venue? I’ve only ever assembled 2 cakes on site and both times it was necessary because of the structure of the cake. So 99% of the time I prefer to take them assembled. Hi Rose! Thanks for the advices. I have a doubt. When you deliver the weddings cakes, are you seting up the cake in the table? If is yes, How do you transport it? Considering how heavy it’s. Do you have something in particular to help you? Thank you! I appreciate your time to help us with your experience. I always deliver my cakes completely assembled. For larger cakes, my husband carries them in for me. For smaller cakes (up to small 3 tier cakes), I carry them myself. you did help alot. Thanks. Thank you for all the info and help! I love your website! About stacking, what if i need to deliver a 6 tier cake, 3 layers of real cake and 3 layers of foam, do I stack all the at home first? And which tiers do you recommend to be the real cake layers, the top or bottom? You need to decide real vs foam based on how many servings the client needs.